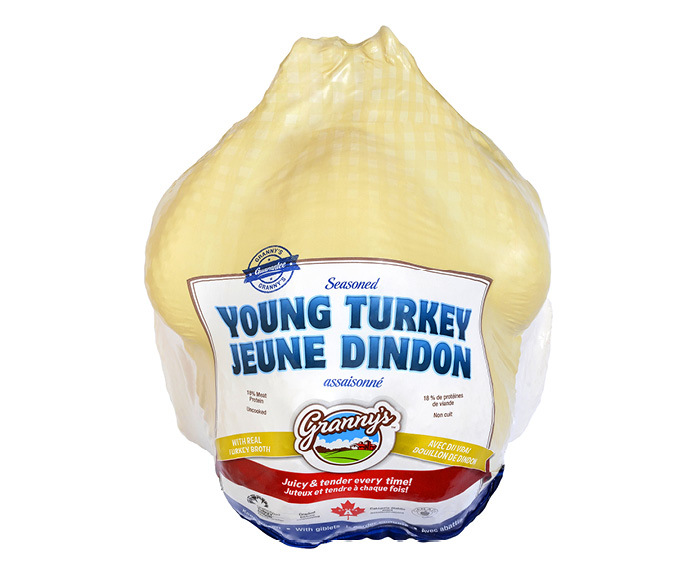 Granny’s Seasoned Grade A Turkeys are raised by one of Granny’s cooperative poultry farmers. This turkey is made with real turkey broth, so it's juicy and tender every time you cook it. OVEN BAKE: Preheat oven to 350°F/ 175°C. Season and place in a roasting pan breast side up. Cover loosely with foil for the first hour. See table below for cooking times. BBQ: Preheat BBQ to approx. 350°F/ 175°C. Season and cook breast side up using a drip pan. See table below for cooking instructions. Insert a meat thermometer in the inner thigh without touching the bone. For a stuffed turkey, the internal thermometer should read 180°F/ 82°C and for an unstuffed turkey the thermometer should read 170°F/ 77°C. Ingredients: Turkey, reconstituted turkey broth (water, turkey broth, salt, flavours), sea salt, rosemary extract.